Simon Rattle was born in Liverpool, the son of Pauline Lila Violet (Greening) and Denis Guttridge Rattle, a lieutenant in the Royal Naval Volunteer Reserve during World War II. He was educated at Liverpool College. Although Rattle studied piano and violin, his early work with orchestras was as a percussionist for the Merseyside Youth Orchestra (now Liverpool Philharmonic Youth Orchestra). He entered the Royal Academy of Music (now part of the University of London), in 1971. There, his teachers included John Carewe. In 1974, his graduation year, Rattle won the John Player International Conducting Competition. After organising and conducting a performance of Mahler's Second Symphony while he was still at the Academy, he was talent-spotted by the music agent Martin Campbell-White, of Harold Holt Ltd (now Askonas Holt Ltd), who has since managed Rattle's career. He spent the academic year 1980/81 at St Anne's College, Oxford studying English Language and Literature. He had been attracted to the college by the reputation of Dorothy Bednarowska, Fellow and Tutor in English. He was elected an Honorary Fellow of St Anne's in 1991. He was admitted to the degree of Doctor of Music honoris causa of the University of Oxford in 1999. In 1974, he was made assistant conductor of the Bournemouth Symphony Orchestra. His first Prom at the Royal Albert Hall, conducting the London Sinfonietta, was, according to the BBC Proms Archive web-site, on 9 August 1976. The programme included Harrison Birtwistle's Meridian and Arnold Schoenberg's First Chamber Symphony. In 1977 he became assistant conductor of the Royal Liverpool Philharmonic. His time with the City of Birmingham Symphony Orchestra (CBSO) from 1980 to 1998 drew him to the attention of critics and the public. In 1980, Rattle became the CBSO's Principal Conductor and Artistic Adviser, and in 1990, Music Director. Rattle increased both his profile and that of the orchestra over his tenure. One of his long-term concert projects was the series of concerts of 20th-century music titled "Towards the Millennium". One other major achievement during his time was the move of the CBSO from its former venue, Birmingham Town Hall, to a newly built concert hall, Symphony Hall, in 1991. The BBC commissioned film director Jaine Green to follow him in his final year with the CBSO to make Simon Rattle—Moving On. Rattle was appointed a CBE in 1987 and made a Knight Bachelor in 1994. In 1992, Rattle was named a Principal Guest Conductor of the Orchestra of the Age of Enlightenment (OAE), along with Frans Brüggen. Rattle now has the title of Principal Artist with the OAE. In 2001, he conducted the OAE at Glyndebourne in their first production of Fidelio with a "period-instrument" orchestra. Rattle strongly supported youth music. He led two attempts at gaining the record for the World's Largest Orchestra, both designed to raise awareness of youth music in schools. The first, in 1996, was unsuccessful. The second, in 1998, did succeed and the record held at nearly 4,000 musicians until it was broken in 2000 by a group in Vancouver. In 2000 Rattle was presented with the Gold Medal of the Royal Philharmonic Society and in May 2006 he was made an Honorary Fellow of the Society of Arts. In 2011, the Royal Academy of Music presented him with an Honorary Doctorate. He was appointed Member of the Order of Merit (OM) in the 2014 New Year Honours. Rattle conducted the London Symphony Orchestra at the Opening of the London Olympics 2012. Rattle made his conducting debut with the Berlin Philharmonic (BPO) in 1987, in a performance of Gustav Mahler's Symphony No. 6. In 1999, Rattle was appointed as successor to Claudio Abbado as the orchestra's principal conductor. The appointment, decided on in a 23 June vote by the orchestra's members, was somewhat controversial, as several members of the orchestra were earlier reported to have preferred Daniel Barenboim for the post. Nevertheless, Rattle won the post and proceeded to win over his detractors by refusing to sign the contract until he had ensured that every member of the orchestra was paid fairly, and also that the orchestra would gain artistic independence from the Berlin Senate. Before leaving for Germany and on his arrival, Rattle controversially attacked the British attitude to culture in general, and in particular the artists of the Britart movement, together with the state funding of culture in the UK. Since his appointment, Rattle has reorganised the Berlin Philharmonic into a foundation, meaning its activities are more under the control of the members rather than politicians. He has also ensured that orchestra members' wages have increased quite dramatically, after falling over the previous few years. He gave his first concert as principal conductor of the BPO on 7 September 2002, leading performances of Thomas Adès' Asyla and Mahler's Symphony No. 5, performances which received rave reviews from the press worldwide and were recorded for CD and DVD release by EMI. Early collaborative projects in the Berlin community with Rattle and the BPO involved a choreographed performance of Stravinsky's The Rite of Spring and a film project with Mark-Anthony Turnage's Blood on the Floor. He has also continued to champion contemporary music in Berlin. The orchestra has established its first education department during Rattle's tenure. Criticism of Rattle's tenure with the Berlin Philharmonic began to appear after their first season together, and continued in their second season. 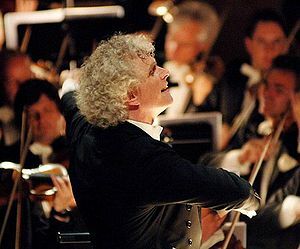 Rattle himself stated in 2005 that his relationship with the BPO musicians could sometimes be "turbulent", but also "never destructively so". Rattle was originally contracted to lead the BPO through 2012, but in April 2008 the BPO musicians voted to extend his contract as chief conductor for an additional ten years past the next season, to 2018. In January 2013, he announced that he would not extend his contract beyond the 2018 season. On 20 June 2018 Sir Simon Rattle conducted his last Berlin Philharmonic Orchestra concert as their chief conductor. UNICEF appointed Rattle and the BPO as Goodwill Ambassadors in November 2007. He is a patron of the Elton John AIDS Foundation. Rattle made his North American debut in 1976, conducting the London Schools Symphony Orchestra at the Hollywood Bowl. He first conducted the Los Angeles Philharmonic in 1979 during the music directorship of Carlo Maria Giulini, and was their Principal Guest Conductor from 1981–1994. He also guest-conducted the Cleveland Orchestra, Chicago Symphony Orchestra, San Francisco Symphony, Toronto Symphony Orchestra and Boston Symphony Orchestra. His New York City debut was with the Los Angeles Philharmonic in 1985. In 2000, Rattle was the Music Director of the esteemed Ojai Music Festival. In 1993, Rattle made his conducting debut with the Philadelphia Orchestra. He returned for guest conducting engagements in 1999 and 2000. The musical relationship between Rattle and the Philadelphia Orchestra was reported to be such that Philadelphia wanted to hire Rattle as its next music director after Wolfgang Sawallisch, but Rattle declined. However, Rattle continues to guest-conduct the Philadelphia Orchestra, including appearances in 2006 and the Philadelphia Orchestra's first performances of Robert Schumann's cantata Das Paradies und die Peri in November 2007. In September and October 2016, Rattle conducted the Metropolitan Opera's new production of Wagner's Tristan und Isolde. It was revealed and confirmed in March 2015 that Rattle had accepted the post of Music Director of the London Symphony Orchestra (LSO), an orchestra which he described in a BBC Radio interview as having the "rare mindset of always looking forward". He took up this position in September 2017. Rattle has conducted a wide variety of music, including some with "period instruments" (either modern musical instruments whose design is similar to that of instruments commonly in use at the time the piece was composed or the actual historical instrument itself), but he is best known for his interpretations of late 19th- and early 20th-century composers such as Gustav Mahler, with a recording of Mahler's Second Symphony winning several awards on its release. He has also championed much contemporary music, an example of this being the 1996 TV series Leaving Home, where he presents a 7-part survey of musical styles and conductors with excerpts recorded by the CBSO. Other recordings in Berlin have included Dvořák tone poems, Mahler's Symphony No. 9 and Claude Debussy's La Mer. The Gramophone Magazine praised the latter as a "magnificent disc" and drew favourable comparisons with interpretations of the piece by Rattle's immediate predecessors, Claudio Abbado and Herbert von Karajan. He has also worked with the Toronto Children's Chorus. Rattle and the BPO also recorded Gustav Holst's The Planets (EMI), which was the BBC Music Magazine Orchestra Choice. In addition, Rattle's acclaimed complete 1989 recording of George Gershwin's opera Porgy and Bess was used as the soundtrack for the equally acclaimed 1993 television production of the work. It was the first made-for-television production of Porgy and Bess ever presented. Rattle's 2007 recording of Johannes Brahms's Ein deutsches Requiem received praise from BBC Music Magazine, as "Disc of the Month" for April 2007, "as probably the best new version of the Requiem I've heard in quite some years." Rattle and the BPO have also released recordings of Anton Bruckner's Fourth Symphony (Romantic), and Joseph Haydn's Symphonies Nos. 88, 89, 90, 91, 92 and Sinfonia Concertante. Rattle's recording of Brahms's Ein deutsches Requiem with the BPO received the Choral Performance Grammy Award in 2008. He has won two other Grammy Awards, one Choral Performance Award for a recording of Stravinsky's Symphony of Psalms in 2007, and another for Best Orchestral Performance for a recording of Mahler's unfinished Symphony No. 10 in 2000. The French Government awarded him the honour of Chevalier de la Légion d'honneur in 2010. He was elected to the inaugural Gramophone Hall of Fame in 2012. Rattle's first marriage was to Elise Ross, an American soprano, with whom he had two sons: Sacha, who is a clarinettist, and Eliot, who is a painter. They were divorced in 1995 after 15 years of marriage. In 1996 he married his second wife, Candace Allen, a Boston-born writer. This second marriage ended in 2004, and in 2008 Rattle married the Czech mezzo-soprano Magdalena Kožená. The couple has two sons, Jonas (2005) and Milos (2008), and a daughter Anežka (2014). Rattle is a member of the Incorporated Society of Musicians and a fan of Liverpool Football Club. Kleinert, Annemarie (2009). Music at its Best: The Berlin Philharmonic. From Karajan to Rattle. Norderstedt: BoD. ISBN 978-3-8370-6361-5. Kenyon, Nicholas (1987), Simon Rattle: The Making of a Conductor, Faber and Faber. ISBN 0-571-14670-8. ^ "Welcome to the Music Service | Music Services". servicesforeducation.co.uk. Retrieved 31 March 2018. ^ Nick Barratt (1 September 2007). "Family detective". The Daily Telegraph. London. Retrieved 27 September 2007. ^ "Artist Details: Sir Simon Rattle". Askonas Holt. Archived from the original on 18 June 2007. Retrieved 17 August 2007. ^ Sholto Byrnes (4 August 2006). "Simon Rattle: Marching to a revolutionary beat". The Independent. London. Retrieved 6 August 2007. ^ Jay, Elizabeth (17 January 2003). "Dorothy Bednarowska". The Independent. Retrieved 16 June 2017. ^ "Muriel Spark and Simon Rattle in honorands list". Oxford University Gazette. 21 January 1999. Archived from the original on 1 July 2012. Retrieved 6 August 2007. ^ "Conferment of Honorary Degrees: Degree of Doctor of Music, Sir Simon Rattle, CBE". Oxford University Gazette (Encaenia 1999, Supplement (1) to Gazette No. 4517). 25 June 1999. Retrieved 6 August 2007. ^ Peter Conrad (29 April 2001). "What's so funny about Beethoven?". The Observer. London. Retrieved 29 March 2007. ^ "Children create world's biggest orchestra". BBC. 23 November 1998. Retrieved 27 March 2010. ^ "World's Largest Orchestra". CBC News. 15 May 2000. Retrieved 27 March 2010. ^ "No. 60728". The London Gazette (Supplement). 31 December 2013. p. 2. ^ Andrew Clements (24 June 1999). "Picking up the baton". The Guardian. London. Retrieved 22 March 2007. ^ Fiachra Gibbons and Kate Connolly (12 June 1999). "Rattle set for classic music's top job". The Guardian. London. Retrieved 22 March 2007. ^ Ivan Hewett (7 September 2002). "Wilkommen Sir Simon!". The Daily Telegraph. London. Retrieved 23 February 2007. ^ Kate Connolly and Amelia Hill (25 August 2002). "Rattle fires parting shot at Brit Art bratpack". The Observer. London. Retrieved 30 January 2007. ^ Vanessa Thorpe (30 September 2001). "Rattle's rage at 'amateur' Arts Council". The Observer. London. Retrieved 30 January 2007. ^ Kate Connolly (8 September 2002). "Roll over Beethoven, here comes Sir Simon". The Guardian. London. Retrieved 17 August 2007. ^ Kate Connolly (9 September 2002). "Rattle's rapturous debut". The Guardian. London. Retrieved 22 March 2007. ^ Martin Kettle (30 August 2002). "My crazy idea". The Guardian. London. Retrieved 22 March 2007. ^ Peter G. Davis (13 February 2006). "German Reengineering". New York. Retrieved 3 April 2007. ^ Tom Service (11 May 2007). "The mighty 'wuah'". The Guardian. London. Retrieved 24 April 2008. ^ Stephen Everson (20 September 2003). "The end of the affair". The Guardian. London. Retrieved 30 January 2007. ^ Charlotte Higgins and Ben Aris (29 April 2004). "Is Rattle's Berlin honeymoon over?". The Guardian. London. Retrieved 30 January 2007. ^ Charlotte Higgins (7 January 2005). "Karaoke, wild tigers, hysteria: Rattle on his turbulent affair with the Berlin Philharmonic". The Guardian. London. Retrieved 22 March 2007. ^ Manuel Brug (11 May 2006). "Überwältigungsmusik, aber kaum Durchdringung". Die Welt (in German). Retrieved 17 August 2007. ^ Alfred Brendel (31 May 2006). "Criticism of Rattle is really out of tune". The Guardian. London. Retrieved 17 August 2007. ^ Erica Jeal (5 October 2007). "Batons at dawn". The Guardian. London. Retrieved 22 November 2007. ^ EMI Music (29 October 2009). "Sir Simon Rattle verlängert Vertrag mit den Berliner Philharmonikern bis 2018". Simon Rattle website. Archived from the original on 19 July 2011. Retrieved 19 January 2010. ^ UNICEF: UNICEF appoints Berliner Philharmoniker Goodwill Ambassador 17 November 2007. ^ "Elton John AIDS Foundation patrons". Ejaf.com. Retrieved 24 December 2012. ^ Allan Kozinn (16 December 1993). "Rattle Leads the Philadelphia In Mahler's Ninth Symphony". The New York Times. Retrieved 30 January 2007. ^ Anthony Tommasini (28 January 1999). "Did Briton, Wielding Sibelius, Audition For a Job?". The New York Times. Retrieved 30 January 2007. ^ Bernard Holland (26 January 2000). "A Sense of Gluttony But an Easy Surrender". The New York Times. Retrieved 30 January 2007. ^ Allan Kozinn (30 January 2004). "Top Conductors, Top Orchestras, Brahms in Common". The New York Times. Retrieved 30 January 2007. ^ Allan Kozinn (9 February 2006). "Bruckner's Seventh and Painterly Tableaus in Song". The New York Times. Retrieved 30 January 2007. ^ Peter Dobrin (25 November 2007). "Passionate about Paradise". Philadelphia Inquirer. Archived from the original on 1 April 2008. Retrieved 24 April 2008. ^ Bernard Holland (3 December 2007). "Repentance as the Key to Open Pearly Gates". The New York Times. Retrieved 24 April 2008. ^ "Tristan und Isolde". www.metopera.org. Metropolitan Opera. Archived from the original on 20 August 2016. Retrieved 20 August 2016. ^ "BBC Radio 4, Front Row". 17 January 2017. ^ Richard Morrison; Jack Malvern (7 September 2013). "Sir Simon Rattle tipped to take top job with the LSO". partial paywall blockage. Retrieved 14 February 2015. ^ "Simon Rattle to lead London Symphony Orchestra". BBC News. 3 March 2015. Retrieved 3 March 2015. ^ Brandle, Lars (23 June 2001). "Classical Brits Win". Billboard. Retrieved 23 March 2017. ^ "Gershwin: Porgy & Bess/Rattle – Review by Robert Levine". Classicstoday.com. Retrieved 24 December 2012. ^ Ivana Redwine (3 July 2001). "DVD Pick: "Porgy & Bess"". about.com. Retrieved 24 December 2012. ^ "GERSHWIN Porgy and Bess Rattle DVD[IL]: Classical Reviews- May2002 MusicWeb(UK)". Musicweb-international.com. Retrieved 24 December 2012. ^ "Sir Simon Rattle (conductor)". Gramophone. Retrieved 10 April 2012. ^ Ed Vulliamy (31 August 2008). "Simon Rattle: bringing Berlin home to Liverpool". The Observer. Guardian. Retrieved 24 December 2012. ^ Debrett's People of Today 2005 (18th ed.). Debrett's. p. 1356. ISBN 1-870520-10-6. ^ Jan Moir (21 March 2003). "I hate to see myself conducting". The Daily Telegraph. London. Retrieved 24 February 2007. ^ Neil Fisher (21 October 2006). "Magdalena and the men in her life". The Times. London. Retrieved 22 November 2007. ^ Vulliamy, Ed (31 August 2008). "Liverpool gets it Rattle back". The Guardian. London. Retrieved 23 May 2010. Wikimedia Commons has media related to Simon Rattle. Website of the film and education project "Rhythm is it! "Simon Rattle collected news and commentary". The New York Times. Phillipa Ibbotson, "He won't play the game". Essay from The Guardian, 19 June 2006. Norman Lebrecht, "Rattle has a battle on his hands". La Scena Musicale, 23 August 2006. Television Interview with Simon Rattle from C Music TV.